Full Titanium Exhaust System with Carbon Fiber Tip. In 2008, Brock Davidson embarked on an ambitious project to design and engineer the finest possible exhaust system utilizing titanium for its unsurpassed strength-to-weight ratio and carbon fiber for its aesthetically appealing look. 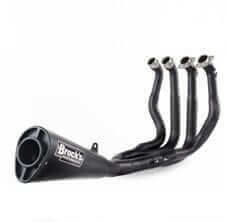 25 years of sportbike drag racing innovation, development, and championships culminates with Brock’s Performance CT Series™ exhaust systems. The CT Series™ is a high-end, all-titanium, full exhaust system that combines state-of-the-art materials and manufacturing techniques with competition-proven performance. The CT Series™ not only gives you superb cornering clearance, but if you are a weekend drag racer, the system provides unmatched ground clearance to give you maximum lowering ability for mind-numbing acceleration. Systems are available in single or dual canister design.